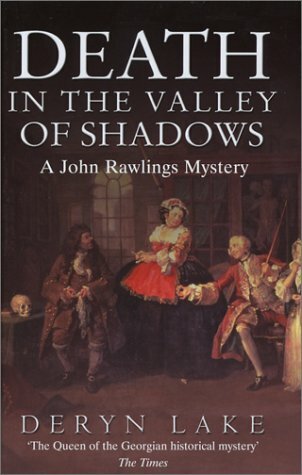 Death in the Valley of Shadows by Deryn Lake: Allison & Busby, London 9780749006419 Hard Cover, 1st British Edition. - William Ross, Jr. Preparing to become a father for the very first time, Apothecary John Rawlings leaves the heavily pregnant Emilia occupied with maternal matters and turns his attention to his business, rather neglected of late. Working in the shop one early afternoon, John is taken aback when a middle-aged stranger rushes in through the door looking panic-stricken. The man is not seeking a cure for a terrible ailment, however, but a place to hide. John agrees and a moment or two later a formidable woman comes to the counter enquiring if the Apothecary has seen anyone answering the description of the stranger he has in his back room. Honoring his promise to the man, John sends her on her way and, intrigued, goes to question the fellow. The man’s name is Aidan Fenchurch and his pursuer is Mrs. Ariadne Bussell, a former lover who is reluctant to give up the chase. So reluctant, in fact, that she has been shadowing him for years. Feeling sympathy for Aidan, John agrees to do him a good turn, but is shocked when a few days later the man is dead, ostensibly the result of a street robbery. Suspicious, Sir John Fielding sends the Flying Runners to arrest Mrs Bussell. However, the lady is taken ill in the coach and before she can be thoroughly questioned she dies. The Apothecary recognises the signs of fatal poisoning. DERYN LAKE is the pseudonym of a well-known historical novelist who joined the popular ranks of historical detective writers with her gripping John Rawlings Mysteries. Deryn Lake lives near Hastings, East Sussex.